This year has proven to be an amazing year for real estate and AM Open House. As many of you know, we launched on July 16th, 2014, and have spent the last 5 ½ months doing everything we can to make real estate agents’ lives easier. I can say, that with the response we have received, we know we are on the right path to making a huge change in the industry. With a few thousand downloads of our app, multiple trade shows; including Disruptor Alley at CMLS, MLSLI Tech Fair, and Triple Play, and unbelievable support from agents, we have reached many of our goals for the first few months of our operation. What have we been up to over the past few months? We have also created a community where more then 50 Open Houses are being held weekly using our platform, new properties are being added every single day, and anywhere between 5 and 10 new people are signing up to use our platform daily. We launched a mortgage professional integration back in November in which agents no longer have to pay for upgraded premium access. The agent receives premium access and we provide the mortgage professional with a login for the site in order to receive leads in real time from the agents they sponsor. Our whole goal is to help agents cut down on busy work, and this has proved to be an amazing piece to our success thus far. Agents across multiple countries are having their mortgage professional sponsor them and they are getting qualified leads in real time. In December of this year, we launched AM Open House for Buyers to change the entire experience at Open Houses. Now, buyers do not even have to sign in on your device as long as they have the AM Open House for Buyers app on their personal phone. Buyers can even keep track of the Open Houses they attended as well as mark properties as favorites during their home search. What’s next for AM Open House? We are currently getting ready for the coming year. We will be attending Inman Connect NYC as a Startup Alley sponsor and we will be attending the SIBOR Agent Day as well. We are planning to attend Inman Connect San Francisco, NAR, as well as Triple Play again next year. 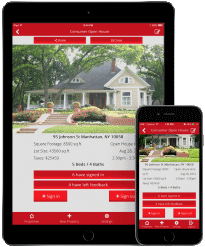 We also have another app in development for agents that will make their broker Open House experience even easier, while allowing them to stay on top of, and organize their activities. This app is slated for early 2015, and we will provide you more information as we get closer to launch. Can you help us get there? Here’s to 2014, and a very successful 2015 for all!